Descriptive Set Theory is the study of sets in separable, complete metric spaces that can be defined, and so can be expected to have special properties not enjoyed by arbitrary pointsets. 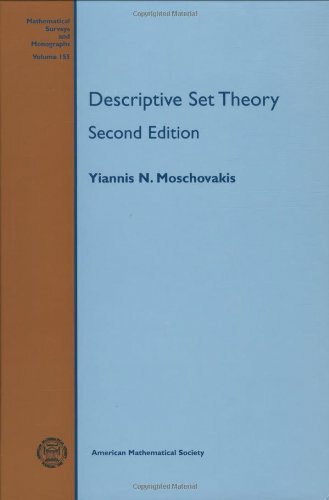 This monograph develops Descriptive Set Theory systematically, from its classical roots to the modern "effective" theory and the consequences of strong hypotheses. The book emphasizes the foundations of the subject, and it sets the stage for the dramatic results relating large cardinals and determinacy or allowing applications of Descriptive Set Theory to classical mathematics. From the table of contents: The Set Concept; Boolean Operations on Sets; Building Finite Structures; The Theory of Relations; Sentences and Sets; Stratified Comprehension; Philosophical Interlude; Equivalence and Order; Introducing Functions; etc. Introduction to conceptual and axiomatic mathematics, the writing of proofs, mathematical culture, with sets, groups and knots as topics. From the table of contents: Introduction; Set Theory; Group Theory; Knot Theory; Summary. Introduction to the set theoretic tools for anyone who comes into contact with modern Mathematics. The intended audience are students of any subject or practitioners who need some knowledge of set operations and related topics. From the table of contents: Basic material on set theory - Overview / Summary, Basic Concepts, Relations, Functions, Natural Numbers, Cardinal Numbers; Rules for Derivations; Formal Languages; Mathematical Induction; Brief History of Numeration.